Emily Weerts directs the Nucleus Learning Network, an organization that empowers learners, educators, and mentors to enhance Austin’s innovative learning community. She stopped by the blog this week to give us a preview of the Maker Education Village she’s coordinating at this year’s Austin Mini Maker Faire, which is shaping up to be the biggest and best yet. In the handful of years since Maker Faire first came to Austin, we’ve seen the event change and grow in many exciting ways. As the list of participating makers expands, one trend that we’re happy to embrace is the notable increase in education-focused makers, booths, and presenters. Making and learning are natural partners: making provides opportunities to develop confidence; increase creativity; explore science, math, and art in new ways; and investigate engineering and technology. This year’s Faire features booths from makerspaces at libraries, organizations that teach computer programming to elementary students, and Austin Community College’s new maker program. From pre-K through college and beyond, makers, learners, and teachers will come together on May 16 and 17 to share their skills, ask great questions, and forge new friendships. This year’s Maker Education Village is being sponsored by WonderLab, a membership-based, supplemental learning lab for children in upper elementary and middle school. Thanks to WonderLab’s generous contribution, we are able to expand the Maker Ed Lounge and run a Maker Ed Stage at this year’s Faire. Check out the Maker Ed program (below) and join us for some inspiring workshops, stimulating discussion panels, and engaging networking. Alt Ed Austin is supporting this year’s Maker Ed Stage, and Nucleus Learning Network is coordinating the Maker Ed Lounge. As always, Maker Faire is free for educators to attend! Tell the teachers in your lives to come to the Palmer Events Center on May 16 and 17 to learn and be inspired. To receive free admission, teachers must bring a school ID or present other proof that they are an educator at the box office. A new home for Austin Tinkering School! Kami Wilt runs both the annual Austin Mini Maker Faire and the year-round Austin Tinkering School, where there are big changes afoot. Kami joins us on the blog today to share the good news. As some of you may know, Austin Tinkering School recently ran a Kickstarter campaign to raise money to create a kid-friendly, community-oriented, centrally located Makerspace. A space like this doesn't exist in Austin yet, and it seems necessary (and awesome!) for a growing, vibrant, Maker city like Austin. Lucky for us, the Kickstarter was a success, and we were able to raise $23,000! After months of looking and, truthfully, feeling a little worried that even with that handsome chunk of change we might not find a place that met our needs, we managed to secure a fantastic spot that is going to allow us to bring many more great tinkering experiences and adventures to kids and adults than we have before. This place is ideally located in East Austin and is just two minutes away from Hausbar Urban Farm, Canopy, Blue Genie, Splinter Group, a playground at Govalle Elementary, and scads of awesome East Side artists and artisans we can go visit whenever we want. It has a HUGE backyard! It also has AIR CONDITIONING! I'll tell you, $23,000 sounds like a lot and it definitely is, but when you start looking at places, you realize you might have to give up on some things, like temperature control or an easy-to-get-to location. And since we didn't know how long it was going to take us to find a new place, we decided to build a nice new outdoor workshop at Austin EcoSchool, so now we have a South Austin hub as well! 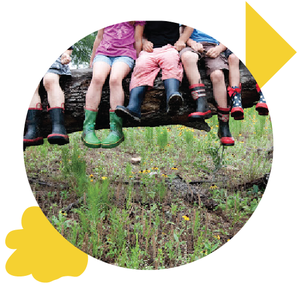 We offer a Friday program there for homeschoolers and alterna-schoolers, and will be running summer camps all summer long at both locations, along with lots of great classes and workshops for kids and adults. 2015 is a brand spankin’ new year with so many tinkering adventures ahead! Can’t wait to have you all over to the new digs. Check us out at austintinkeringschool.com. Mike DeGraff is a former high school math teacher currently working with secondary STEM teacher programs across the country as part of the UTeach Institute. He is passionate about education and extremely interested in the role of the emerging maker culture in schools. 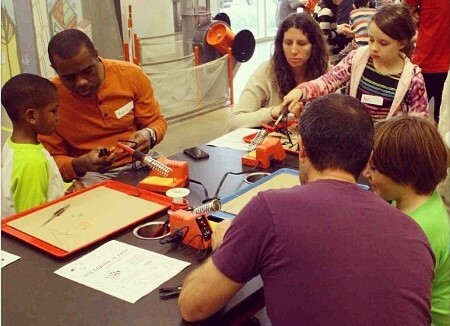 As a new guest contributor, Mike is here to invite Alt Ed Austin’s readers to the first in a series of Maker Ed Meetups on Wednesday, August 6, 7–9pm at the TechShop in Round Rock. Join the group and RSVP for the event on the Meetup page. Making, the heart of the growing “maker movement,” has become one of the most exciting developments in education. You could barely attend a session at last year’s SXSWedu conference without hearing about it. Even the White House is into it. Part of what makes it exciting is that making is so accessible and is starting to happen everywhere. Right now, for example, Make magazine and Google + are hosting the third annual virtual Maker Camp (July 7–August 15), where anyone with a computer or access to a library can participate in making cool stuff. According to the Maker Camp FAQ, “many of the materials you need for the projects are likely already available in your home.” This means we’re not talking about projects that need to be done at a place like TechShop with extensive equipment. Speaking of TechShop, it is AWESOME! 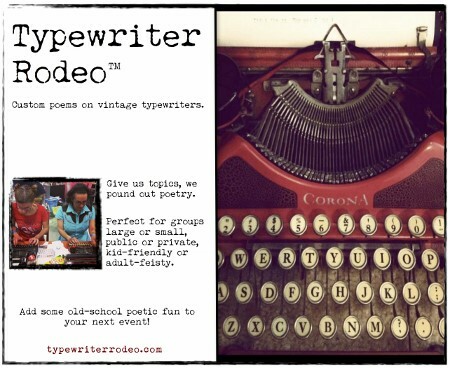 If you are an educator, you should seriously check it out. It has the tools for you to build anything you can imagine (even battery-operated human exoskeletons). In fact, you should make plans to be there Wednesday, August 6, at 7pm for the very first Austin Maker Ed Meetup. There will be amazing maker educators showing off super cool stuff like the MaKey MaKey (banana piano? why yes! ), stop-motion animation, and a mini nerdy derby. It’s open to makers, educators, and anyone else interested in this movement. The Austin Maker Ed Meetup is a result of my interest, and then immersion, in maker culture over the past few years. I am a former high school math teacher with an interest in project-based/inquiry-based/constructivist approaches to education. As I got into maker culture, I found that it resonated with my understanding of and beliefs around how people learn and how schools can support hands-on learning. I finally jumped in with both feet after attending the World’s Maker Faire 2013 in New York City. I saw a lot of people already making explicit connections between education and the maker movement, most notably the Maker Education Initiative (launched in 2012) and the associated space at the Faire dedicated to these efforts. I came back from that event eager to get involved with the maker education activities in Austin, but I wasn’t sure how. So in true maker fashion, I began doing instead of just reading and thinking. I reached out to the maker organizations in Austin, like the Thinkery, Austin Tinkering School, Austin Mini Maker Faire, TechShop, and others. Not surprisingly, maker folks were willing and excited to show me all the things they were doing in the realm of education. The meetup at TechShop is our effort to continue those discussions and strengthen the connections between makers and educators. We’ll have cool stuff to share and do, with the hope that educators will be introduced to new ideas that can have a positive impact in their classrooms. However, the power of this group will not be what it shows educators, but in the exploration and connection between two overlapping groups: makers and educators. What making looks like in our schools is just now entering the national education discussion, so there’s plenty of room for experimentation and innovation. A lot of this national discussion is about the specific tools and resources of the maker culture, such as 3D printing, CNC machines, laser cutters, and other innovative technology. I think all of this stuff is worth the discussion; it’s amazing. But what excites me most is not the flashy new tech, but the connections to the progressive education movement, which has been around since the late 19th century, and other current research-based practices. Some examples include an emphasis on understanding over rote knowledge, a focus on critical thinking, learning by doing, and personalized education based on students’ individual interests. The tech will come and go (and hopefully come again after kids destroy and rebuild it into new stuff), but this approach to learning seems much more accessible, targeted, and individualized. I hope it will prove to be the most influential aspect of the maker movement on education. 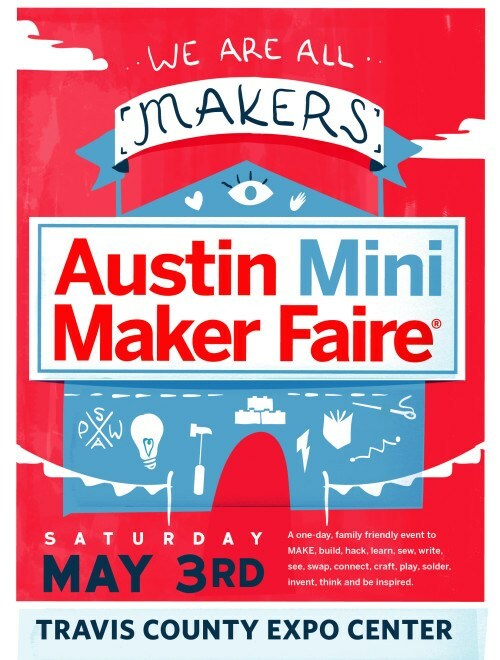 Giveaway alert: A family pack of Austin Mini Maker Faire passes is up for grabs, plus free tickets for professional educators and a special discount code for homeschoolers! Read on. I love the theme of this year’s Austin Mini Maker Faire, as expressed in the beautiful posters designed by Kat Townsend: We are all makers. 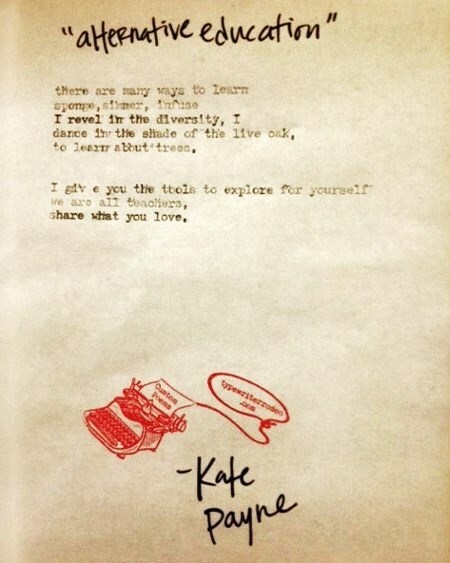 Even more exciting for me (and the reason Alt Ed Austin is a proud sponsor of AMMF 2014) is its brilliant demonstration of another theme: We are all learners. We are all teachers. Underlying its well-deserved reputation for outlandish fun in the tech, craft, art, robotics, and sustainability arenas, the heart of Austin’s annual maker extravaganza is education. At a time when our traditional school systems are deep in crisis, the Faire serves as a showcase for learning experiences as they should be: hands-on, interdisciplinary, learner directed, multi-age, naturally engaging, noncompetitive, playful, and focused on using critical thinking skills and imagination to address real-world problems. Free admission for professional educators! Just show some proof that you are an educator at check-in. Educators’ Lounge. This year we’re giving teachers and other education professionals a comfy place at the Faire to take a break and meet new colleagues. We’ll also facilitate some quick and fun ways for educators to trade ideas about incorporating making into their learning environments and overcoming maker ed challenges. As a thank-you for participating in the Lounge, we’ll have some great teacher-oriented swag bags. Many thanks to supervolunteers Mike DeGraff, Claudia Pepper, and Laura Minnigerode and these sponsors for making all of this happen: Five Elements Furniture, SparkFun, Texas Instruments, and UTeach. Three huge tents devoted to Maker Ed. Fairegoers will experience a dizzying array of hands-on activities and demonstrations presented by schools and other educational programs from pre-K through college levels. Anchored by AMMF sponsor Skybridge Academy, these edu-makers will give Fairegoers opportunities to sharpen their wilderness survival skills, practice the fine art of bubble making, learn how a couple of local high school kids have built a 3D printer, and much, much more. 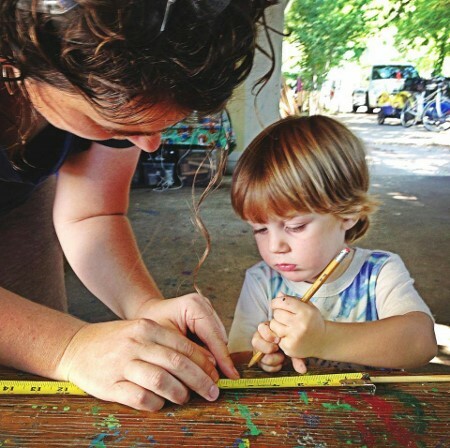 In the ever-popular Austin Tinkering School pavilion, kids can make their own racecars and try their luck in the Nerdy Derby, or hang out in the Open Shop, deconstructing electronics and creating their own marvels with all kinds of interesting building materials. The Thinkery’s Kid Zone will offer multiple STEAM (science, technology, engineering, art, and math) activities for young makers. Its hand-built trebuchet will be flinging things the old-fashioned way throughout the day. On the outdoor stage, kids of all ages will be amazed and edified by the Mad Science show. Grownups will learn to safely wow their friends and enemies with the fiery arts at Tim Deagan’s Propane 101 for Artists and Makers. And everyone, I mean everyone, will have a blast at Steve Wolf’s multi-award-winning Science in the Movies show. Check out the performance schedule and plan your day at the Faire! Inside the Expo Center arena, beyond the planetarium, aerial dancers, and the gajillion fascinating craft, tech, and arts exhibits, you’ll find a workshop space where you can learn to program a Raspberry Pi, ferment your own vinegar from table scraps, make a perfect hula-hoop, or turn your small business dreams into reality. Reserve your space in a workshop today! This is only the tip of the iceberg, people. I’ve highlighted the overtly educational features of the Faire, but no matter how you choose to spend your time at AMMF, you’ll learn something. Jump off a tower into a giant marshmallow with the Stunt Ranch crew, find out how an intrepid professor is sustainably living in a dumpster for a year, or pedal like you’ve never pedaled before at the Austin Bike Zoo’s Interactive Wonderland and Carnival. I guarantee you’ll come away with that unmistakable feeling that we are all learners, we are all teachers. And for sure, we are all makers. You have a bunch of ways to enter this random drawing, with up to 10 chances to win an AMMF family pack of 2 adult and 2 child passes. If you’ve already bought your tickets, be sure to let your friends know about this opportunity to attend the Austin Mini Maker Faire for free! Enter by midnight Thursday, May 1, and we’ll announce the lucky winner right here in a blog update on Friday morning. Good luck! UPDATE: Congratulations to giveaway winner Suzanne H.! We look forward to seeing you and your family on Saturday. And thanks to everyone who entered the drawing. You can still buy discounted AMMF tickets in advance (through 10am Saturday) here. Guest contributor Emily Weerts is the Innovators’ Workshop Manager at the Thinkery, the new Austin Children’s Museum. Emily grew up in Northern California and is the daughter of an avid crafter and a handy model maker. A “Maker” before there was a “Movement,” Emily attended the first Maker Faire in California in 2006 before moving that summer to Austin, where she subsequently attended the 2007 and 2008 Austin Maker Faires. Emily dabbles in many Maker pursuits including screen printing, traditional and e-textiles, glass arts, paper crafts, robotics, and kitchen concoctions. If you’ve been to the Thinkery, you may have noticed the two-story climbing structure or the drenching water exhibit, but before you got to the Light Lab, did you stop by a project table? Maybe you chatted with a resident artist working on a sculpture made from recycled materials. Or perhaps you spent some time tinkering with some LED lights, batteries, and conductive play dough. Did you pop into Kitchen Lab and create something out of corn starch plastic? Making is a fundamental experience that the Thinkery wants to encourage and share with visitors of all ages. In 2007 when Maker Faire came to Austin, staff at the Austin Children’s Museum recognized a shared value of learning through Making. In 2008, the Museum partnered to bring an extensive Maker Kids area to the Faire, and in the summer of 2009, the Museum developed and presented a Maker Kids feature exhibit to bring the Maker experience to many more visitors. In designing the new museum, opportunities for Making and hands-on creative problem solving were at the heart of the planning process. 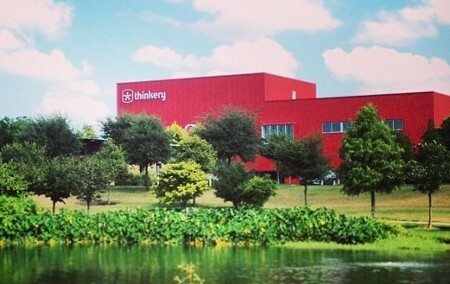 Since the Thinkery opened in late 2013, Making has taken many forms. Visitors stopping in for an hour or two are most likely to encounter Making at the project tables in the Innovators’ Workshop, Spark Shop, and Kitchen Lab. Here at the Thinkery we define Making broadly and encourage all people to think of themselves as Makers. At its simplest, Making is the act of creating something; from a quilt to a batch of cookies, there are learning opportunities at every step of the way. Making emphasizes skill development, like learning how to properly use a power drill or how to stitch a seam. When presented in the context of a project, difficult concepts become more manageable. Multiplying fractions makes a bit more sense when done in the service of quadrupling a recipe. Suddenly, while designing a quilt, finding the hypotenuse of a triangle really is as easy as a2 + b2 = c2. Use real tools. Toys are lots of fun, but there are also many safe ways to introduce real tools to novice learners. Use a wooden mallet instead of a hollow plastic toy hammer. Introduce a three-year-old to stitching by using a yarn needle and plastic canvas. It’s okay to fail. No great Maker gets perfect results every time. Far from it! Often the best learning happens during the process of making something and learning from mistakes. Take (calculated) risks, and don’t take yourself too seriously. Making takes practice. Learning a new skill can be intimidating, but remember that the best Makers didn’t start out as experts; they had years of practice. With lots of practice, you can be great at anything. When people are encouraged and equipped to make things themselves, they gain a strong ownership over their learning. Let the Maker and the project guide the learning process. Forget “Do-it-Yourself.” Making is most fun and productive when it’s done with others. 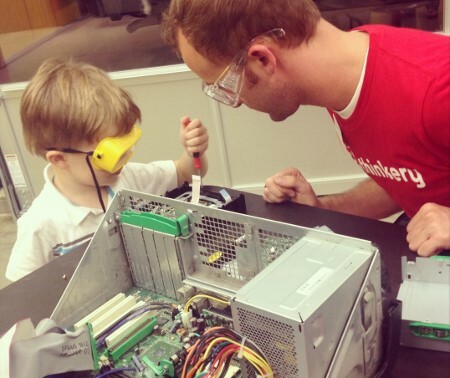 Pair novice Makers with Maker Mentors to see how much everyone learns from each other. Let’s start a “Make-it-Together” movement! Embrace your own “I don’t know” moments. It’s okay that you don’t know how to solder or use a sewing machine. You can still help learners by colearning, finding resources, or connecting them with Maker Mentors. Resist the urge to “do it for them.” Keep your hands off the tools and materials as much as possible. Show learners how to do something and let them try it themselves. If you aren’t sure where to get started, consider coming up with a Maker Resolution. At the Thinkery, we had all our staff set Maker Resolutions for 2014. Our diverse and creative team came up with a huge spectrum of projects for the new year, from creating a stop-motion animation music video to baking and decorating a three-tiered cake. One of our staff members resolved to learn how to make a website, and one of our Teen Volunteers plans to make her own prom dress. May this year and all the years to come be filled with creativity, innovation, tinkering, and Making! Join Emily and other Thinkery staff and volunteers on May 3 for some all-ages Making at this year’s Austin Mini Maker Faire!